Compassion in World Farming recently launched its new campaign in a one-night only event at the Natural History Museum in London. 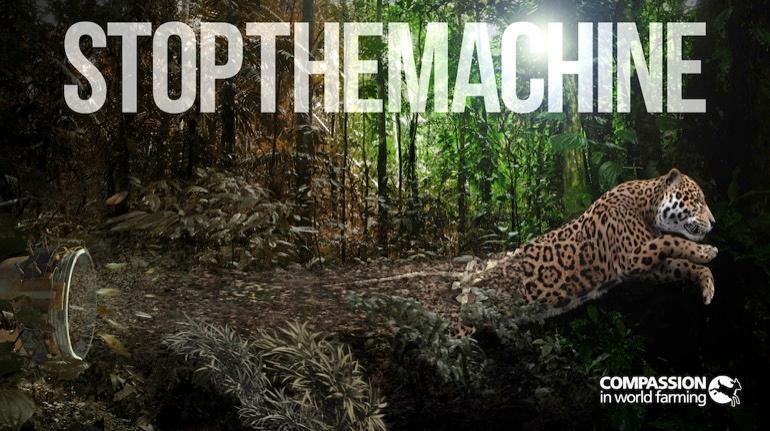 STOPTHEMACHINE explores the link between factory farming and the devastating impact this is having on some of the world's most iconic wild animals. The campaign calls for an urgent rethink of the way we produce and consume food – before it's too late. Factory farming is driving many species – including the Sumatran elephant, African penguin and Brazilian jaguar –to the brink of extinction, but we can halt this decline, says Compassion in World Farming. The organisation says that the everyday food choices we all make could help save these much-loved animals. The launch event was attended by actors Peter Egan and Evanna Lynch, and influential figures including leading British environmentalist Tony Juniper and conservationist Stanley Johnson. Informed by the global investigation undertaken by Compassion in World Farming's Chief Executive, Philip Lymbery for his new book – Dead Zone: Where the Wild Things Were – the immersive exhibition demonstrates how once diverse lands and waters are now over-farmed and over-fished, all to feed billions of animals crammed into cruel factory farms. “Many people attribute the decline of iconic species to climate change and habitat destruction. However, few know that intensive farming – fuelled by consumer demand for cheap meat – is one of the biggest drivers of species extinction and biodiversity loss on the planet,” said Compassion in World Farming. The organisation points out that in the last 40 years, the number of mammals, birds, reptiles, amphibians and fish globally has halved – and species are disappearing at a rate 1,000 times faster than would occur naturally. Huge swathes of wildlife habitat are being destroyed across the world to make way for intensive crops, which are then fed to intensively reared animals. These monocultures are doused with agrochemicals – which are harmful not just to animals, but to people too. Compassion in World Farming says that we end up with less calories in meat, eggs and milk from the animals, than we started with in crops. 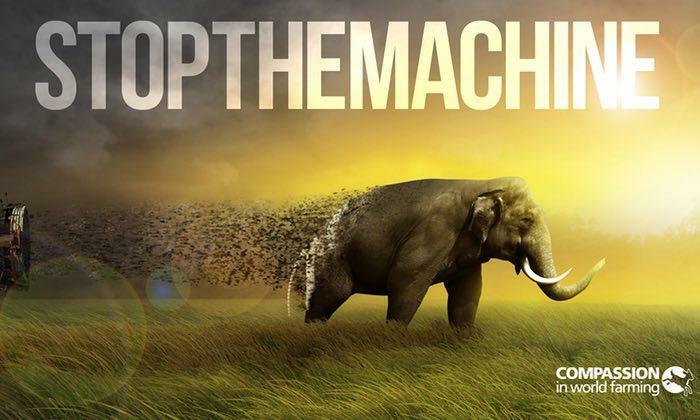 STOPTHEMACHINE aims to open people's eyes to the global demand for food that drives two-thirds of the loss of wildlife happening today. Compassion in World Farming's CEO, Philip Lymbery, said: “There's a faceless, heartless, relentless machine out there sucking the life out of our forests and oceans. It's so powerful, the animals don't stand a chance. This machine is factory farming. He added: “The campaign encourages consumers to choose pasture-fed, free-range or organic foods and urges governments to support alternative farming methods that work in partnership with nature and the wildlife that lives there.